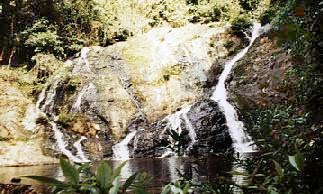 Lata Meruang - A scenic Waterfall, golf course and a series of rapids hidden from public sights. 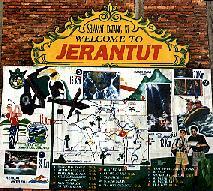 Jerantut, a major town and connecting link just outside of the Taman Negara National Park has many attractions of its own in its hinterland. Example - Just 5 kilometers west of town there is a turnoff from the Main Road to the left. This is the road to an Aborigines villages. Further on, along this same track lies one of the more scenic Waterfalls. Lata Meruang! Beyond the settlements, the track meanders through forested zone. 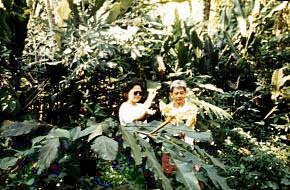 Ironically, from a jungle like environment- we emerged into a huge clearing. There was a golf course under construction and this recreation park. Just a stone throw away from the Golf Course. This is a rather unusual waterfall. From a small river, the falling water was widely dispersed along the upper edges of the cliff. By the time the water makes its way down the broad cliff wall, it projects an appearance of an even small waterfall. But it is a tall waterfall- about 20 meters tall as shown by our model. Look carefully - a quarter of the way up on the left bottom corner between 2nd and 3rd waterways. Now a human is that small, can imagine the actual size of the waterfall? If you care to do some exploration, continue along the track. Alongside the broad timber truck track, there is another tributary. Proceed upstream until a bend some 3 kilometers later, where clear trails leading down the ravine's wall. The river was well concealed, deep down inside a 80 meters deep gorge. Here, along the stretch of river, there were 3 large pools, one waterfall and cascading water the whole way down.